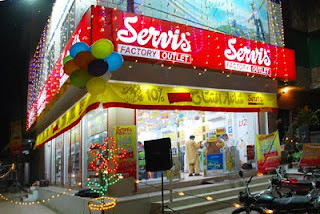 Servis Group has it’s headquarter in Lahore while it has two factories; one in Gujrat and other in Muridke on Sheikhupura Road. Servis Shoes are the largest Footwear exporters of Pakistan. Servis Shoes are available throughout Pakistan on more than 250 retail stores of Servis. Ch. Nazar Muhammad, Ch. Muhammad Hussain and Ch. Muhammad Saeed started their business in 1941 from the manufacturing of hand bags and they started the production of footwear in 1954.
all are good ,but on prices are not listed. sir, we went a 80,pairs of air born article no AB-BO-0002-black, chappal. Can sports shoes are avail in factory rate???? aoa , chwalana19@gmail.com is my email address. sir, I want to be open an service shoes shop.